It’s February, and while the calendar still says it’s winter, and the forecast, for the most part, shows freezing morning temperatures, the hint of spring is in the air. The days are starting to get longer, and sunny afternoons have you leaving your coat behind, dreaming of spring. Springtime in the South is a beautiful season, with flowers blooming and comfortable temperatures. It’s a great time to be outside and enjoy spending time with friends and family at cookouts or beside the pool. If you’ve been thinking of adding an outdoor living space to your home, now is the time to get started. By planning early and getting your job scheduled, you’ll have the space you’ve been dreaming of just in time to enjoy it with spring’s warmer weather! 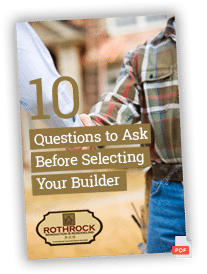 Our team at Rothrock Renovation & Remodeling has plenty of experience in creating outdoor living spaces to help you design and build just what you’ve been dreaming of. Whether you’re wanting to go all out with a pool and patio or an outdoor kitchen, or you’re thinking of keeping it simple with a fire pit and small gathering place, we can help you choose the right materials and create a space to help you enjoy the beautiful climate of the Carolinas. If you’re looking to spruce up your landscape and add a place to entertain friends or hang out with the family, a fire pit is a fun and simple way to expand your outdoor living space. It’s also relatively quick! Once you choose what type of fire pit or fireplace you would like, we can schedule a time for construction and have your space ready to use within a matter of days. Adding a source of heat to your outdoor deck or patio is a great way to extend the enjoyment of your space, allowing you to stay outside even when temperatures get a little chilly. Check out our earlier blog on fire pits to get an idea of the different options available and what might be best for you. One of our favorite projects is building outdoor kitchens for clients in the Winston-Salem area. There are a lot of great materials available to help create a space that’s functional, long-lasting and beautiful, which helps make these jobs a pleasure to design. This is a project that you need to plan ahead to have ready to roll for spring. From start to finish, it can take anywhere from a few weeks to a couple of months, depending on the equipment you’re ordering and the size of the space you’re building. Start by doing some research online to get a feel for the type of appliances you would like, and what materials look good to you for the patio and counter tops. Once you call in our team of experts, we can look at your space and help pin down the details of the plan. We’ll work with you to figure out the right layout and design, choose the types of counter and length that fit your needs, and help you figure out what type of power will work best for your kitchen. In a matter of weeks, you will be able to enjoy cooking and dining al fresco! When it comes to outdoor entertaining, a swimming pool is the centerpiece for hours of fun and enjoyment. This is also a project that takes some advance planning. Depending on the type of pool and the amount of construction around it, this type of project can take weeks to even months. We can help you get the pool you want to enjoy your home all summer long, and build a surrounding area that will lend itself to relaxation and entertainment. It’s important to consider what type of surrounding area you want to accent your pool, including landscaping features and lighting, when making plans. If this type of project is what you have in mind, call us today to set up a consultation to get your project in the works so you’ll be up and running in time for warm weather.